Orthodontics - Pediatric Dentist and Orthodontist in Avon, OH. The American Association of Orthodontists (AAO) recommends an orthodontic screening for children by the age of 7 years. At age 7 the teeth and jaws are developed enough so that the dentist or orthodontist can see if there will be any serious bite problems in the future. Most of the time treatment is not necessary at age 7, but it gives the parents and dentist time to watch the development of the patient and decide on the best mode of treatment. When you have time on your side you can plan ahead and prevent the formation of serious problems. Research has shown that serious orthodontic problems can be more easily corrected when the patient’s skeleton is still growing and flexible. By correcting the skeletal problems at a younger age we can prepare the mouth for the eventual eruption of the permanent teeth. If the permanent teeth have adequate space to erupt they will come in fairly straight. If the teeth erupt fairly straight their tendency to get crooked again after the braces come off is diminished significantly. After the permanent teeth have erupted, usually from age 12-14, complete braces are placed for final alignment and detailing of the bite. Thus the final stage of treatment is quicker and easier on the patient. This phase of treatment usually lasts from 12 – 18 month and is not started until all of the permanent teeth are erupted. Doing orthodontic treatments in two steps provides excellent results often allowing the doctor to avoid removal of permanent teeth and jaw surgery. The treatment done when some of the baby teeth are still present is called Phase-1. The last part of treatment after all the permanent teeth have erupted is called Phase-2. Crowded teeth, thumb sucking, tongue thrusting, premature loss of baby teeth, a poor breathing airway caused by enlarged adenoids or tonsils can all contribute to poor tooth positioning. And then there are the hereditary factors. Extra teeth, large teeth, missing teeth, wide spacing, small jaws – all can be causes of crowded teeth. Tooth movement is a natural response to light pressure over a period of time. Pressure is applied by using a variety of orthodontic hardware (appliances), the most common being a brace or bracket attached to the teeth and connected by an arch wire. Periodic changing of these arch wires puts pressure on the teeth. At different stages of treatment your child may wear a headgear, elastics, a positioner or a retainer. Most orthodontic appointments are scheduled 4 to 6 weeks apart to give the teeth time to move. When teeth are first moved, discomfort may result. This usually lasts about 24 to 72 hours. Patients report a lessening of pain as the treatment progresses. Pain medicines such as acetaminophen (Tylenol) or ibuprofen (Advil) usually help relieve the pain. The part of your braces which actually moves the teeth. The arch wire is attached to the brackets by small elastic donuts or ligature wires. Arch Wires are changed throughout the treatment. Each change brings you closer to the ideal tooth position. 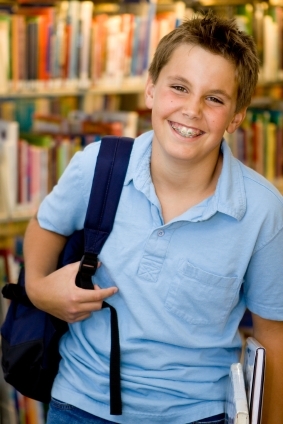 Brackets are the “Braces” or small attachments that are bonded directly to the tooth surface. 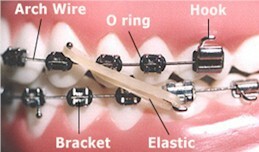 The brackets are the part of your braces to which the dentist or assistant attaches the arch wire. Occasionally, a bracket may come loose and become an irritation to your mouth. You can remove the loose bracket and save it in an envelope to bring to the office. Call the office as soon as possible and make an appointment to re-glue the bracket. At some time during treatment, it will be necessary to wear elastics to coordinate the upper and lower teeth and perfect the bite. Once teeth begin to move in response to elastics, they move rapidly and comfortably. If elastics (rubber bands) are worn intermittently, they will continually “shock” the teeth and cause more soreness. When elastics are worn one day and left off the next, treatment slows to a standstill or stops. Sore teeth between appointments usually indicate improper wear of headgear or elastics or inadequate hygiene. Wear your elastics correctly, attaching them as you were told. Wear elastics all the time, unless otherwise directed. Take your elastics off while brushing. Change elastics as directed, usually once or twice a day. Often called a “night brace”. The headgear is used to correct a protrusion of the upper or lower jaw. It works by inhibiting the upper jaw from growing forward, or the downward growth of the upper jaw or even by encouraging teeth to move forward, if that is the case. A Malocclusion where the upper teeth stick out past the lower teeth. A Malocclusion where the lower teeth stick out past the upper teeth. This is also called an “underbite”. Vertical overlapping of the upper teeth over the lower. Horizontal projection of the upper teeth beyond the lower. When top teeth bite inside the lower teeth. It can occur with the front teeth or back teeth. O rings, also called A-lastics, are little rings used to attach the arch wire to the brackets. These rings come in standard gray or clear, but also come in a wide variety of colors to make braces more fun. A-lastics are changed at every appointment to maintain good attachment of the arch wire to the bracket, enabling our patients to enjoy many different color schemes throughout treatment. posterior (back) tooth until the permanent tooth can grown in. up” to upper jaw growth. permanent teeth to correct the crowding. and new bone fills in the space. any other teeth. The plastic button on the palate provides stability. not retained. It is extremely important to wear your retainers as directed! You will be shown the proper care of your braces when your orthodontic treatment begins. Proper cleansing of your mouth is necessary every time you eat. Teeth with braces are harder to clean, and trap food very easily. If food is left lodged on the brackets and wires, it can cause unsightly etching of the enamel on your teeth. Your most important job is to keep your mouth clean. If food is allowed to collect, the symptoms of gum disease will show in your mouth. The gums will swell and bleed and the pressure from the disease will slow down tooth movement. BRUSHING: You should brush your teeth 4-5 times per day. FLUORIDE RINSE OR GEL: May be recommended for preventive measures. Clean the retainer by brushing with toothpaste. If you are wearing a lower fixed retainer be extra careful to brush the wire and the inside of the lower teeth. Always bring your retainer to each appointment. Avoid flipping the retainer with your tongue, this can cause damage to your teeth. Place the retainer in the plastic case when it is re-moved from your mouth. Never wrap the retainer in a paper napkin or tissue, someone may throw it away. Don’t put it in your pocket or you may break or lose it. Excessive heat will warp and ruin the retainer. If elastics (rubber bands) are worn intermittently, they will continually “shock” the teeth and cause more soreness. Sore teeth between appointments usually indicate improper wear of headgear or elastics or inadequate hygiene. Wear your elastics correctly, attaching them as you were told. Wear elastics all the time, unless otherwise directed. Take your elastics off while brushing. Change elastics as directed, usually once or twice a day. Please feel free to contact the office if you are experiencing any discomfort or if you have any questions. Below are a few simple steps that might help if you are unable to contact us or if you need a “quick fix”. Occasionally, a glued bracket may come loose. You can remove the loose bracket and save it in an envelope to bring to the office or leave it where it is, if it is not causing any irritation. Call the office as soon as possible in order for us to allow time to re-glue the bracket. If a wire is poking your gums or cheek there are several things you can try until you can get to the office for an appointment. First try a ball of wax on the wire that is causing the irritation. You may also try using a nail clipper or cuticle cutter to cut the extra piece of wire that is sticking out. Sometimes, a poking wire can be safely turned down so that it no longer causes discomfort. To do this you may use a pencil eraser, or some other smooth object, and tuck the offending wire back out of the way. Please be careful to avoid hard or sticky foods that may bend the wire or cause it to come out of the back brace. If this does happen, you may use needle nose pliers or tweezers to put the wire back into the hole in the back brace. If you are unable to do this, you may clip the wire to ease the discomfort. Please call the office as soon as possible to schedule an appointment to replace the wire. Rinse with warm water, eat a soft diet, take acetaminophen (Tylenol) or ibuprofen (Advil) as directed on the bottle. Chewing on the sore teeth may be sorer in the short term but feel better faster.